Mac and Cindy Curtis, next year’s Heart Ball co-chairs. The American Heart Association last month welcomed over 450 of the region’s leading physicians and corporate, health care and community leaders to its annual Greater Washington Heart Ball, raising a record-breaking $2.2 million. Held Feb. 23 and themed “Hearts of Gold,” the black-tie gala was again held at the Mandarin Oriental Hotel. The gala is dedicating the funds to cardiovascular disease and stroke research and community initiatives. 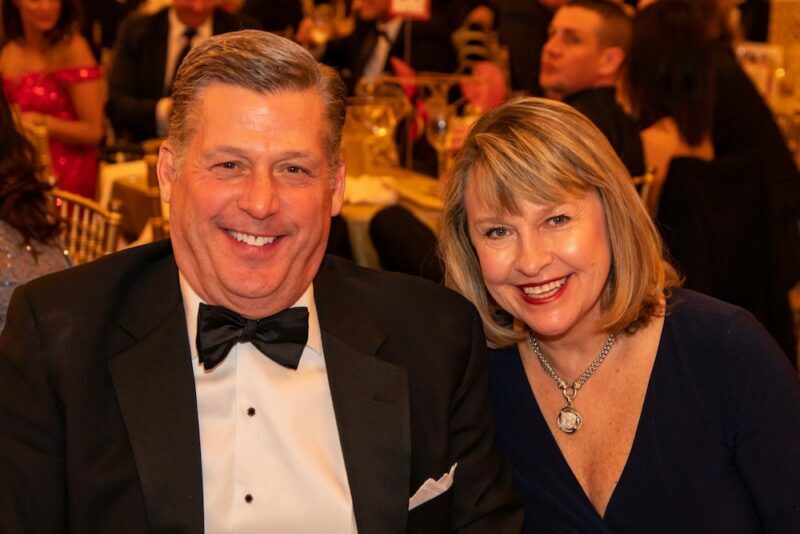 This year’s Heart Ball Co-Chairs Karen and Dale White, executive vice president of sales and account management for MultiPlan, Inc., welcomed guests to the event. The evening featured a live auction, speakers and a special performance by “Late Night” host and comedian Seth Meyers. It closed with the official afterparty, Heart After Dark, hosted by AHA’s young professionals committee Pulse. The event’s heart disease awareness and fundraising efforts were led by the Open Your Heart segment, which highlighted a local family with a personal connection to heart disease. Abigail and Paul Rueger shared their story of their 1-year-old triplet daughters — Julia, Elisa and Rose. Julia was born with only half a heart because of hypoplastic left heart syndrome, and was treated at the Children’s National Medical Center in Washington, D.C. She directly benefited from the research and clinical care made possible by AHA funding. “Everybody has some connection to heart disease, whether it’s directly or a relative or a family member or friend … it’s not only that the Heart Ball raises so much money but that it also just celebrates everything that not only the community does but the AHA staff and all the work that they do throughout the year,” said Laura Grogan, executive assistant to Dale White. 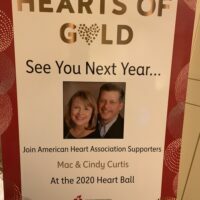 Grogan said she came up with this year’s ball theme in honor of the Whites and their own personal connection to heart disease, as well as the couple’s commitment to philanthropic work through AHA and elsewhere. “They’ve inspired me so much with all that they do through organizations like the American Heart Association and other smaller charities or just random acts of kindness that I always describe them as having a ‘heart of gold,’” Grogan said. Soula Antoniou, executive director of the Greater Washington Region AHA, said she hopes this year’s Heart Ball attendees could “feel the mission” of AHA and join the organization as a “relentless force for a world of longer, healthier lives” in the Greater Washington Region. In addition to supporting local cardiovascular disease and stroke research projects, Antoniou said funds raised from the ball directly supported the installation of the first AHA blood pressure kiosk machines placed in D.C. and Hampton Roads, Virginia. The funds also supported AHA’s Little Hats, Big Hearts program, which provides hand-knit red hats to newborns born in February and information kits and CPR instructions to their parents to raise awareness about congenital heart defects.